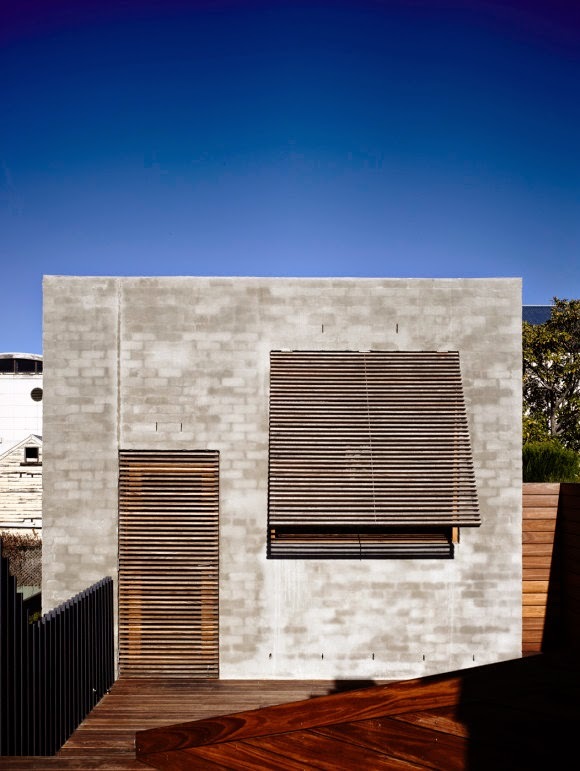 Designed by Rob Kennon Architects, East West House sits on a deep site near the top of Richmond Hill in Melbourne, Australia. 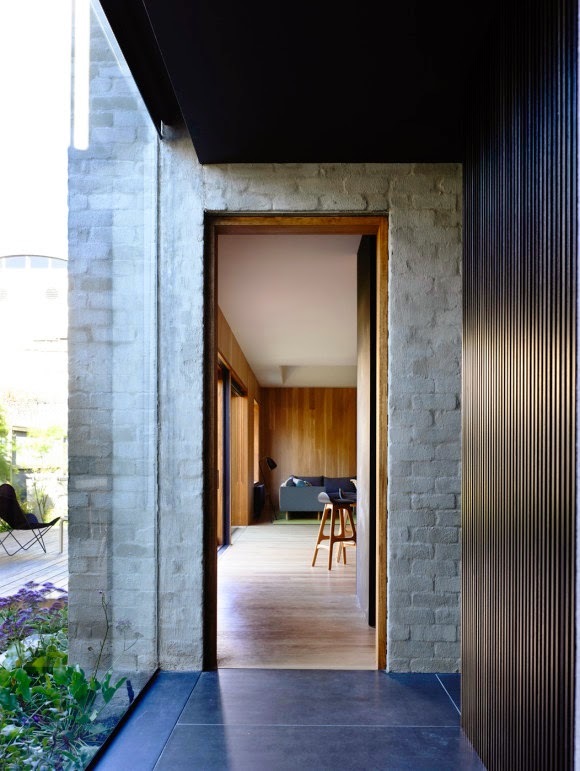 An original Victorian heritage building was restored, with a separate contemporary but contextually responsive extension introduced at the rear of the house. The two, visually separated structures are connected through a glass link, with hidden utility spaces behind. Internally, the new open living, dining and kitchen areas are associated by the consistent use of solid oak flooring, walls and joinery. 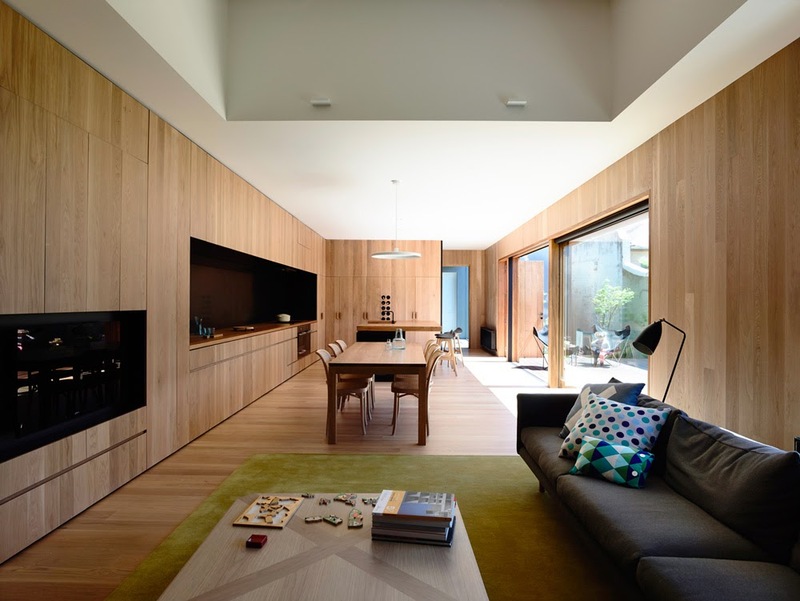 The tight oak grain brings natural warmth to the space. 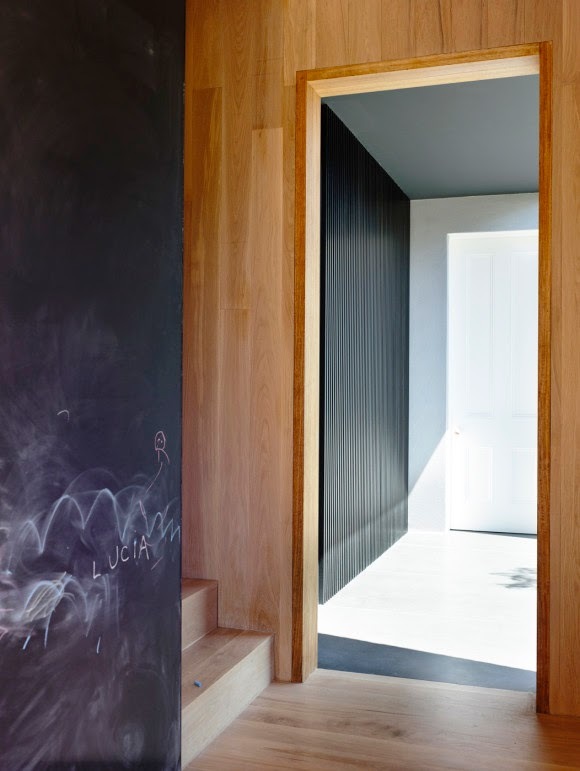 This house, on a deep site near the top of Richmond Hill contains the unexpected. 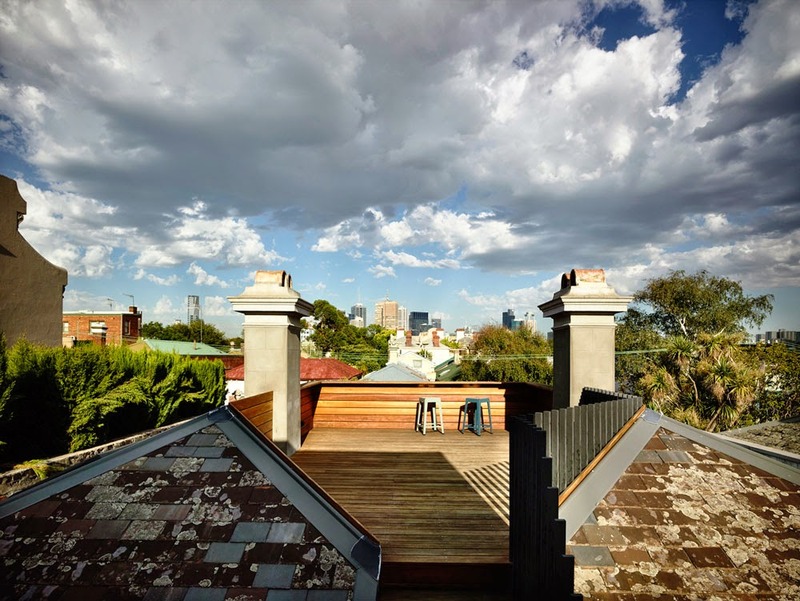 A large roof deck is hidden behind the heritage protected Victorian roofline, like a secret lookout over the Melbourne skyline. The deck which extends from the upper-level master bedroom, bridges the two fundamental aspects of the house. 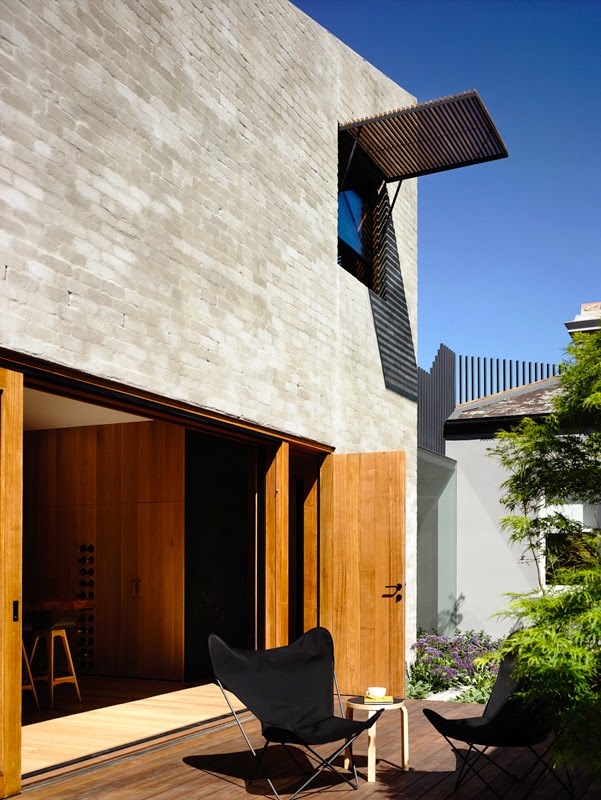 It links the restored early Victorian heritage building with a separate contemporary but contextually responsive extension designed for a downsizing couple with regularly visiting family and grandchildren. The scheme involved demolition of the lean-to at the rear, complete restoration of the existing front four rooms (including a new bathroom, which took the space of an existing room without disturbing the heritage fabric) and the addition of a rear contemporary structure with living space, carport, upper-level master bedroom and roof deck. 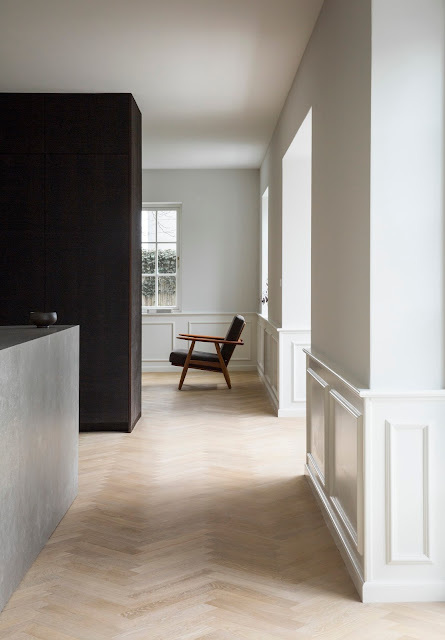 The existing Victorian detailing was stripped back to highlight the elegant fireplace arches, Baltic pine flooring and timber mouldings. 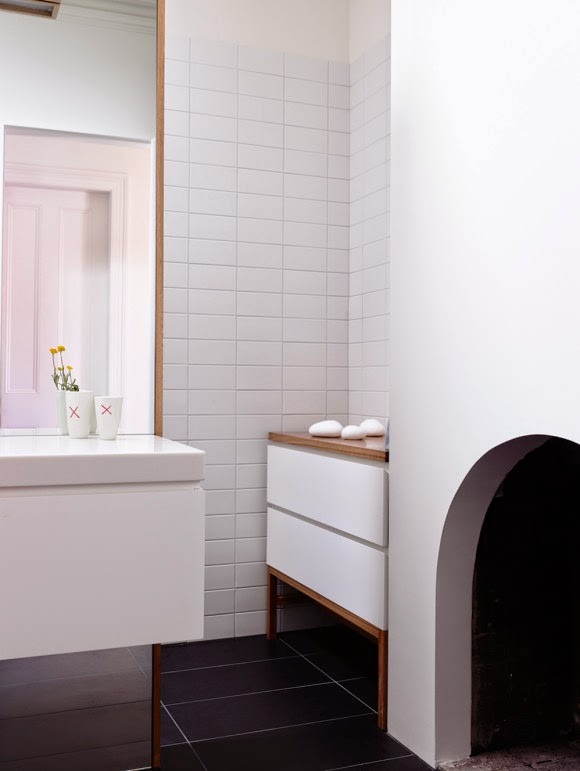 Freestanding (not built in) bespoke joinery neatly fits into the existing fireplace recesses to clearly define the old and new. The east-west site orientation cleverly turns an apparent design detriment into a major design feature. 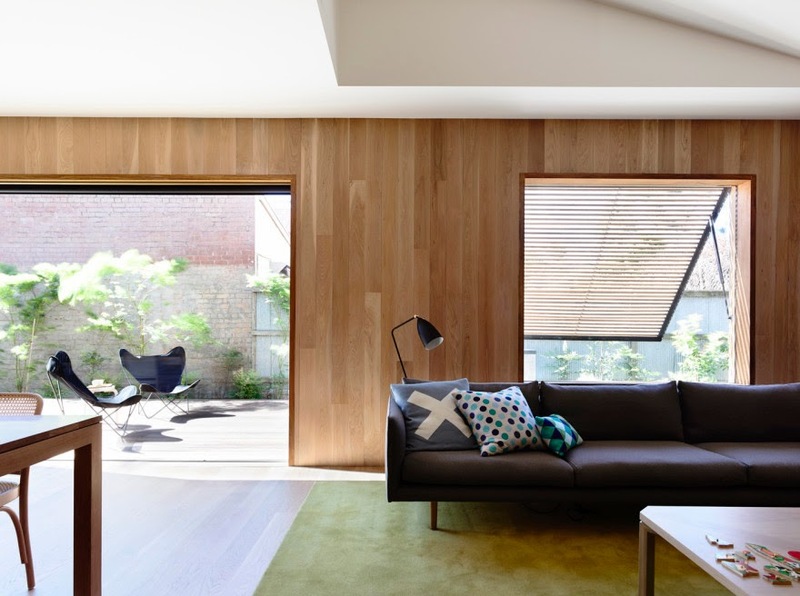 The long rear extension abuts the south boundary to achieve a delightful rear northern orientation, much longer than possible from a north-south site of similar size. The new structure is visually separated from the heritage building by a glass link, with hidden utility spaces behind. 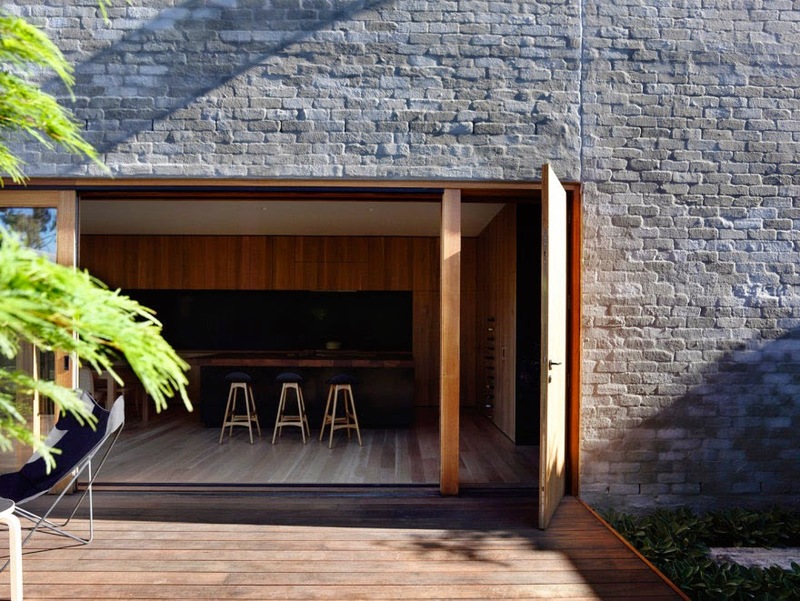 A series of glazed connections, incorporating a large sliding glass door, a fixed door, a picture window and a frameless section, provide each space its own special interaction with the immediately adjacent garden. 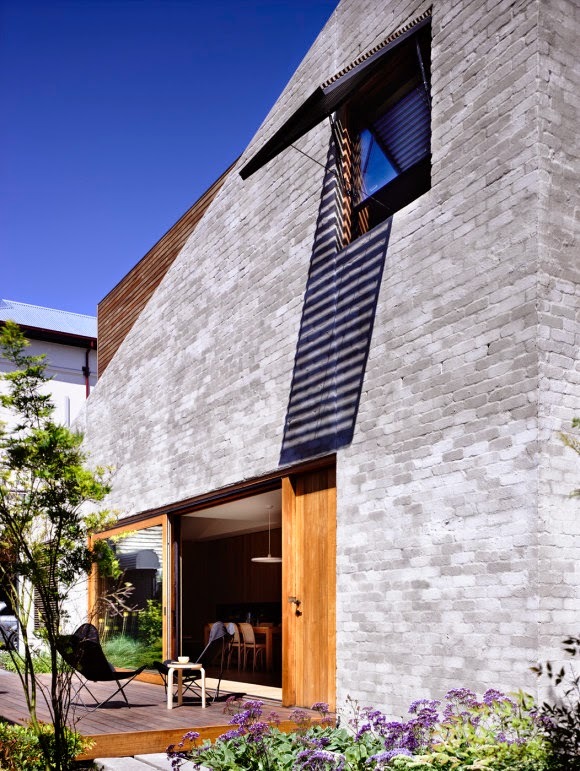 To reduce its mass, the upper storey is constructed as a timber framed setback pop-up, out of the triangular masonry form. 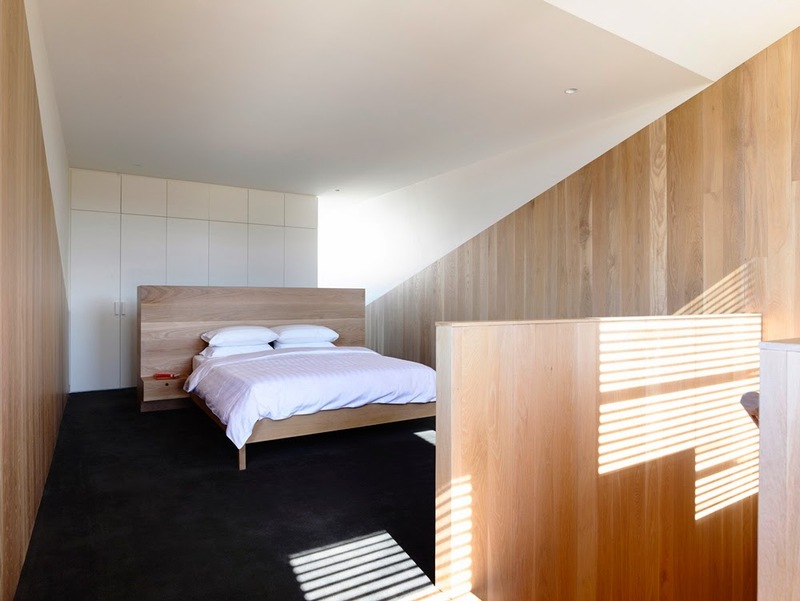 The bedroom receives filtered northern and western light through batten shutters, which control the heat in warmer months. 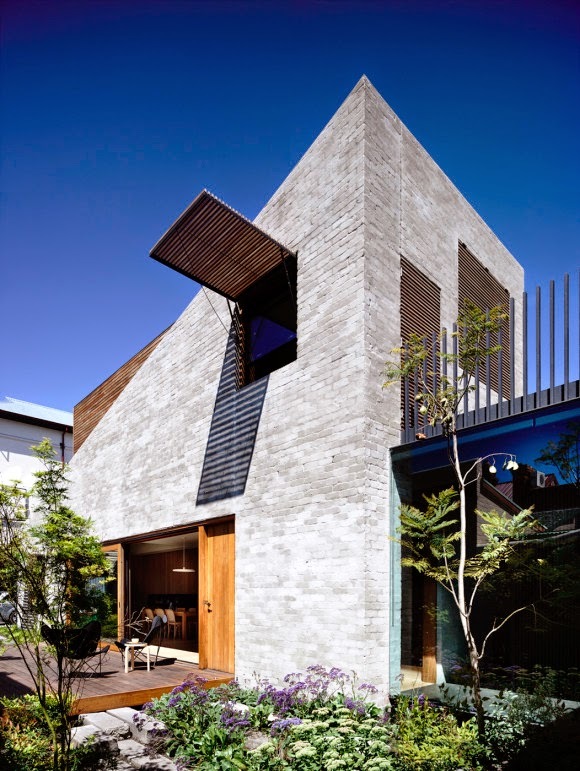 Externally, the addition is constructed out of recycled pressed red bricks with rough natural sand and cement render. 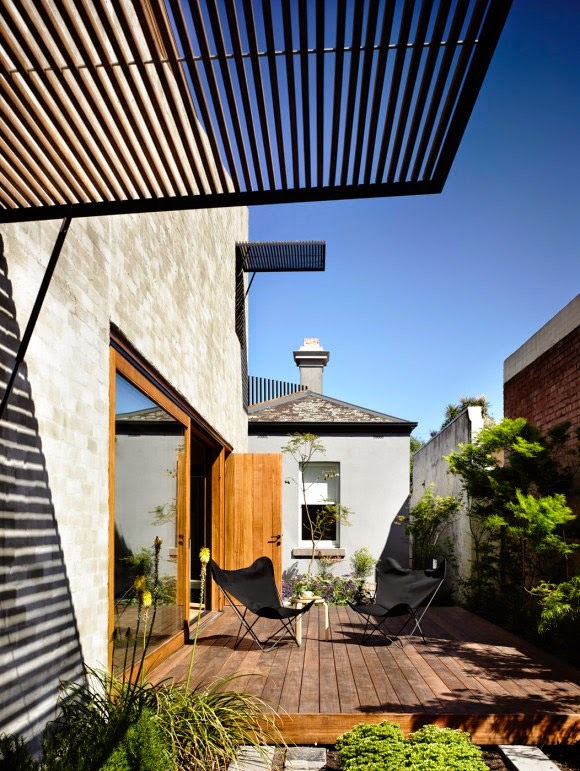 This sits comfortably with the aged bluestone and other materials of the original early Victorian house. 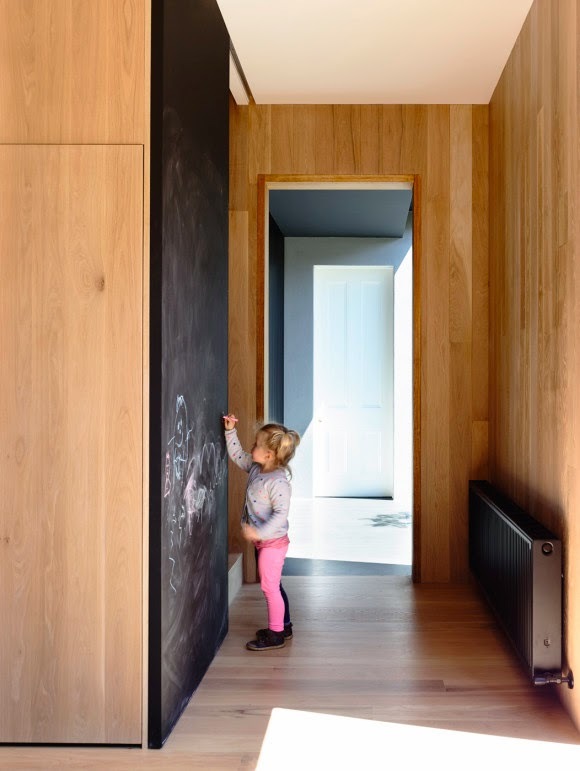 Internally, the new living, dining and kitchen areas are associated by the consistent use of solid oak flooring, walls and joinery. 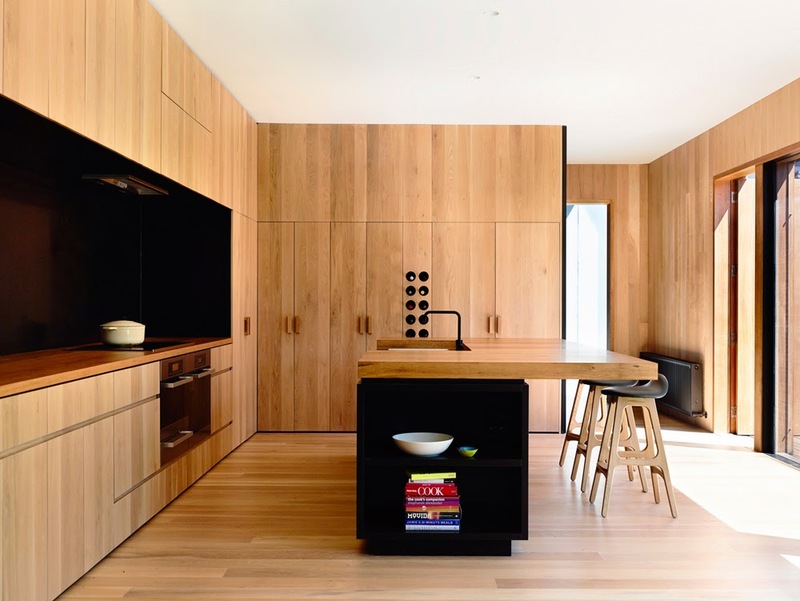 The tight oak grain brings natural warmth to the space. 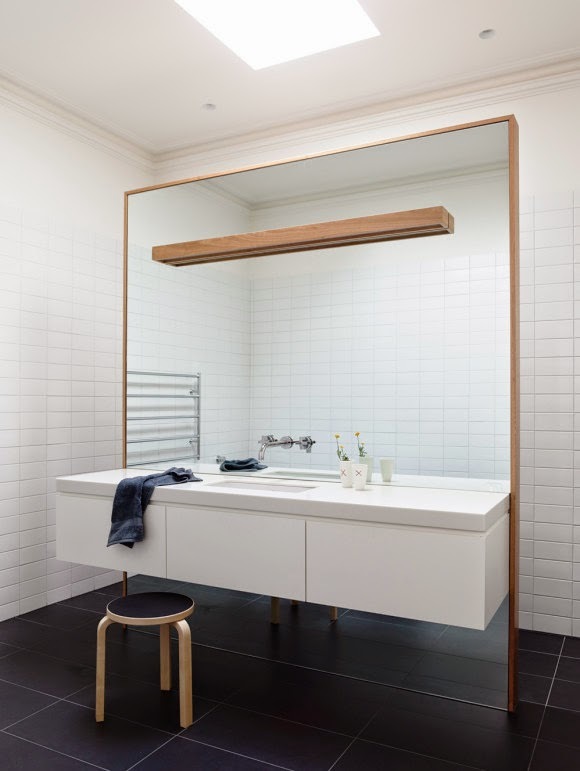 The fine detailing of the junctions, joinery doors, recesses and fittings provoke an appreciation of the considered way in which the space has been crafted. Further, the changing volumes, lighting and varied glazed connections to the garden differentiate the various functional spaces.